Color your favorite stories from the Book of Mormon and Pearl of Great Price. Find games, scripture stories, videos, and more at children.lds.org. Check out our new online art gallery! Monthly inspiration for only $8 a year. Look for this icon on pages that support “Come, Follow Me” scripture study. Here's an example! 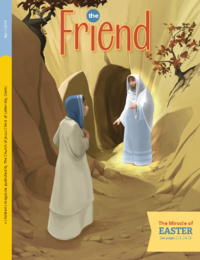 Download the section for younger Friend readers. Play a new activity, print updated special witness cards, or explore other activities. This page can help you with home evening. Margo and Paolo will take you to a different country each month! This month, learn about Jesus as our Savior. Print music for “When I Return to Him.” Watch a sing-along video here! Feeling Sad, Lonely, or Scared? Print comfort cards and read a message from Sister Aburto. You are loved! Follow the Friend on Facebook!